We’ve listed our favorite Hula Hoop games for kids on the Birthday Party Ideas 4 Kids website! 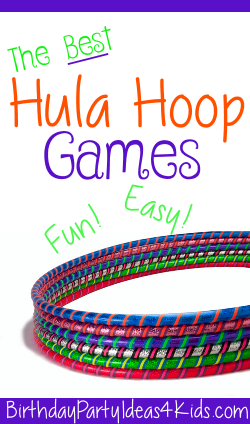 Over 12 of the best Hula Hoop games for kids, tweens, teens and adults. Great for birthday parties, backyard get togethers, camping, at the park, school or family reunions! Fun, unique games that are easy to play and lots of fun. Hula Hoops are cheap (only 1.00 at the dollar store!) and can be used in so many different ways. Add a few house hold items like beach balls or bean bags and you have all you need to play all of the games we have listed. Make sure to check out our Birthday Party themes page where we have over 200 fun, creative and unique birthday party themes all with themed games, activities, party food, favors, decorations and more. Let us help you get the party started! Previous:Pool Noodle Games – No pool required!